Congrats to the winners of my Greecie Girl Headband giveaway, Teresa, at Fit in Woodbine and Mia D'Albora! 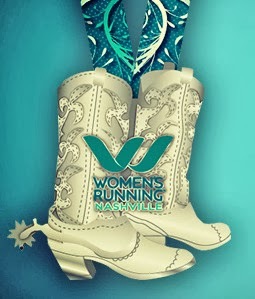 Tomorrow Julie and I leave for Nasvhille to run the Womens Half Marathon on Saturday! I can't wait!! It will be #5 for me. This is a special race because it was my very first half marathon last year. Read about it here! I love reading back on that and just seeing how far I've come. At that time I couldn't imagine ever running a marathon, and now I'm getting ready to run my 2nd marathon, and I have 2 more scheduled after that! I also have a goal to run an ultra next Spring...100 miles. Crazy, yes. But I also thought running 26.2 was crazy. Anything is possible! My friend Jen, from Dare Run Share is running it too, and I can't wait to meet her! This awesome bling will be mine!! It'll definitely be my coolest medal ever! I'm still counting down the days until Chicago!! 16 days! I never thought it would get here. I know it'll be the experience of a lifetime. Can you still donate to the Ronald McDonald House Charity, who I'm running for? I'm so glad you asked. You certainly can! I have a little over 2 weeks to raise $600. Not freaking out at all. Not one bit. Please go here to donate. Thank you!! Are you racing or running this weekend? Here's the plan I'm going to follow. The longest run is only 30 miles, but it looks like you do long runs on Sat and Sun, instead of only 1 day a week. This is going to take some dedication!! I cannot wait to hear about your 13.1 and 26.2 races.....and following your ultra journey! I've heard of the 3 day Susan B Komen walk. I would love to do that. Running 20 a day is my kind of fun! Ooh that medal is fancayyy ;) Have a great race! And WOW 100 miles? That's going to amazing! Thanks girl! Yep, that is my goal!! 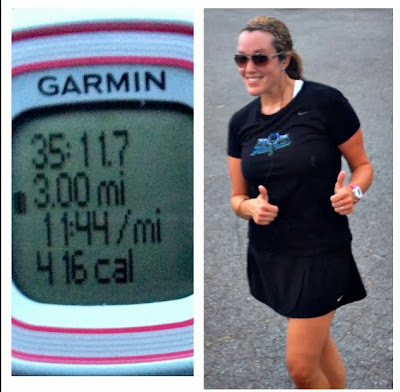 Women's Half Nashville is my first half marathon!! I am soo ready for it! I cant wait! Awesome!! It's a great first half! Maybe I'll see ya there! Katie! Congrats girl! I'm so excited for you :) I'm not running a race this weekend, but I am doing my first half marathon in October! And I'm scared out of my mind. I've only ever run 5K races, so this is a biggie for me. I still have more training to do, but I'm stoked! Any tips for a first-timer? Thanks Sydney!! I'm so excited for your first half in Oct. They are addicting!! As for tips, I bring 2 GU's with me, you never know if they'll have them on the course and I need that boost of energy. Don't go out too fast, run your own race at your pace. (I still have a hard time with that, but it's worth it in the end.) Don't do anything new or different on race day. Just take it 1 mile at a time and have fun!! You're so sweet, Betsy. Thanks girl!! Yeah congrats to Teresa!!! So jealous of that medal you are going to get this weekend - good luck - and we'll see you at Pinkberry in just 2 more weeks!!! 100 miles... O.M.G. Awesome! All the bet for your halfy this weekend and enjoy. I love halves! I am planning to run 32km this weekend (20 miles). Eek! Definitely the coolest race medal I have seen! I love half's too. They're still my favorite distance. Good luck on your 20 miler! You can do it, Rachel!! Oh I LOVE that medal! You're going to rock it pretty lady! Can't wait for your post and pictures! That is a pretty fun looking medal! I can't believe Chicago is only 16 days away!!! Yes it is! I can't believe it either. It's almost here! I just did my last long run before Chicago today, 25 miles. Now I just have to find a way to run the last 1.2 miles and I will be fine. Good luck and I will think of you as I run, hoping to find the 4:30 pace bunny and start there and finish ahead of the 5 hour bunny. It's my first marathon so whatever I do will be a PR. Wow, 25 miles! That's great. Lol, that last mile is the hardest! I'm so excited it's your first marathon. I can't wait!